Whether you have a beloved doll handed down through the generations that is missing a finger, a fabulous yard sale treasure that needs new hair or a Tiny Betty from your collection that fell and broke her leg, finding antique doll parts is often not as difficult as it seems. When an antique doll needs a repair or a new part, there are a few options the doll owner can consider. For a true doll lover, the third option is not even a consideration. After all, discarding, selling or giving away a family heirloom or a member of a treasured collection is unthinkable. Many doll owners and collectors do choose to send their broken dolls to a doll hospital for replacement parts and other needed repairs. However, depending on the doll and the needed repair, this option can be very expensive. Unless the doll is significant, has historical value or you are simply too afraid to attempt the job, most simple doll repairs can be done at home. Sometimes when a doll owner decides to send a broken doll to a doll hospital, they search for, and buy, the repair parts ahead of time. They then send the parts along with the doll to the hospital. By doing this they save the doll restorer the time of finding the part, reducing the cost of the repair. If you decide to do this, always check with the hospital first since there are many doll hospitals that have a large stock of antique and vintage doll parts in stock. Calling the doll manufacturer if they are still in business. Even if they do not have the doll part you need, they may be able to tell you where to locate it. Check with local doll hospitals. If they have the piece you need for the repair they may sell it to you. Online auctions and antique malls such as eBay, Ruby Lane and TIAS often have listings of parts for antique dolls. If you are not able to locate an original part for your antique doll, there are many companies selling reproduction parts for antique dolls. Some of these companies even custom-make the part exactly to the specifications they are given. There are many online businesses that sell reproduction doll parts for antique and vintage dolls. Both The Little Doll Shoppe and Dollspart Supply provide a wide range of services and doll parts. The doll parts are made either as bisque, which is a matte unglazed porcelain, or glazed bisque porcelain, which has a shine similar to glass. On their website, The Little Doll Shoppe has a comprehensive catalog with all sizes of replacement parts clearly listed, instructions on accurately measuring your doll's limbs and a price list. This company also has a supply of old stock wigs and blown glass eyes. Darwi Compound is a modeling compound that is sometimes used to make small antique doll parts and repairs. Darwi Compound stays the same shape even after it dries. 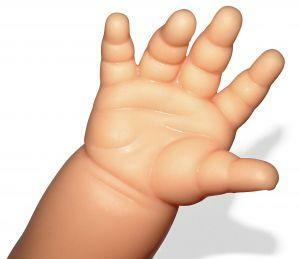 It works well for modeling small pieces such as fingers and toes or filling in large chips in the doll's trunk.